Hello, this is Matt Smith. He's the Doctor. For another season, at least. 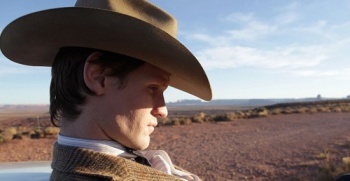 A lot of folks were unsure about Matt Smith when he took over the title role in Doctor Who from David Tenant. That said, a lot of people consider Smith to be the best Doctor to pilot the Tardis, and they're undoubtedly going to be thrilled with the news that Smith has been confirmed for another full season of the show. Sam Hodges, BBC1's Head of Communications broke the news via Twitter: "Fourteen new episodes have been commissioned with Matt Smith as The Doctor." Steven Moffat, too, tweeted a confirmation: "14 eps + Matt DEFINITELY. I've got a plan and I'm NOT TELLING YOU WHAT IT IS. Now hush or River shoots you with her Spoiler Gun." Moffat confirmed that the fourteen episodes will include a 2011 Christmas special, as well as a thirteen-episode season for 2012. Now, what hasn't been confirmed is whether the Doctor's companions, Amy and Rory Pond. Actors Karen Gillan and Arthur Darvill have yet to be confirmed for another season, but we can't read too much into that before anything official is announced. Even if Amy and Rory don't come back, Smith's return is great news: It means another season of bow ties, fezzes (maybe), and sonic screwdrivers (definitely).